Ten new flowers on Saturday, another new flower on Sunday -- and an orchid, at that! Yes, I would say I had a good weekend. When my friend Evelyn Greene alerted me that Hooded Ladies' Tresses (Spiranthes romanzoffiana) were blooming up near Thirteenth Lake, I just couldn't wait another day to zoom on up there to see them. I had never seen this species of Ladies' Tresses before, and I was eager to see how they differed from the much more common Nodding Ladies' Tresses (Spiranthes cernua). Well, God bless dear Evelyn, who's always willing to lead a fellow nature nut off to a new location. And she knows them all! 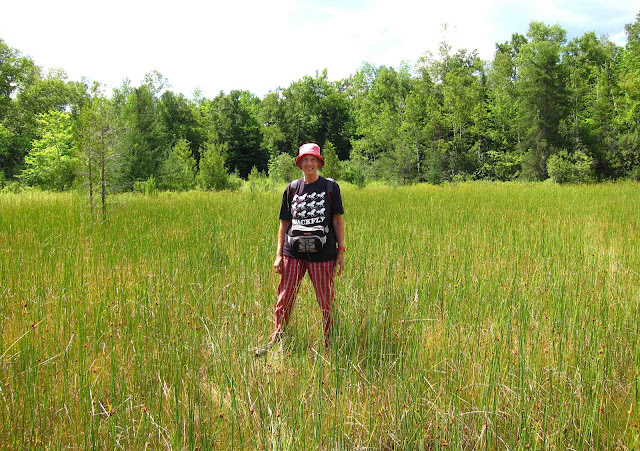 Here she is, standing in an open wet meadow called Putty Pond. As you can see, it's no longer the pond it used to be when the stream that fed it was dammed to provide a water supply for a nearby (now defunct) garnet mine called Hooper's Mine. If you click on this photo, you just might be able to make out the many white spikes of Ladies' Tresses blooming abundantly among the grasses and sedges at the edge of Putty Pond. 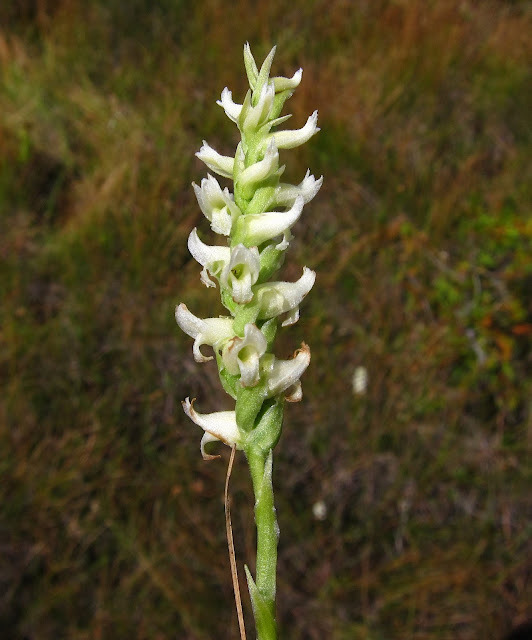 At first glance, this Hooded Ladies' Tresses looks quite a bit like the more familiar Nodding Ladies' Tresses, except that the florets are somewhat more uplifted. The key difference is how the lower lip is somewhat fiddle shaped, narrowing in the middle before flaring out at the end. Other factors in identifying this little orchid are its location in a wetland that is more alkaline than acidic (S. cernua prefers more acidic soils) and also its blooming time in the middle of summer. I wouldn't normally start looking for Nodding Ladies' Tresses until late in August. Another interesting plant that was new to me was this Three-square Rush (Schoenoplectus americanus) (Oops! See note below), which absolutely filled the area that once was a water-filled pond. True to its name, this plant has stems that are triangular in cross-section. I wonder why it's not called "Three-angled Rush" instead, since a square would have to have four angles. 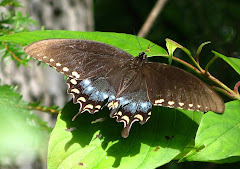 Update: A very helpful and knowledgeable reader named Diana has corrected me on the ID of this rush, as readers of the comments section will discover. 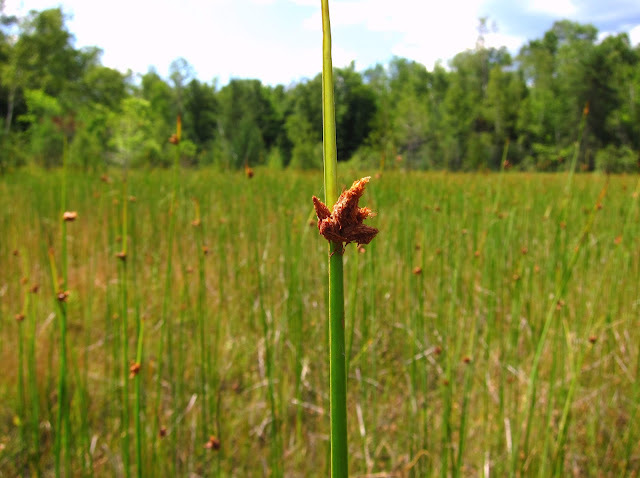 This is Schoenoplectus pungens, NOT S. americanus, although its common name of Three-square Rush remains correct. 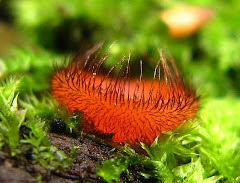 Evelyn had given me its (correct) Latin name as Scirpus americanus, and when I looked up information about it on the internet, I saw that the genus name Scirpus had been changed to Schoenoplectus, but I failed to note that the species name had changed as well, to pungens. Thanks, Diana, for setting me straight. 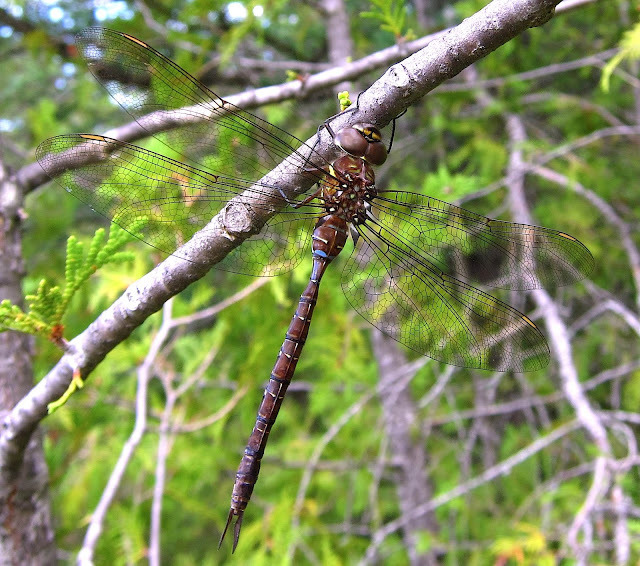 We were intrigued by this large brown dragonfly that hung vertically on a tree in the shade of an adjoining thicket. I believe it's one of the Darners, but I couldn't match it exactly to any pictures in my dragonfly guides. 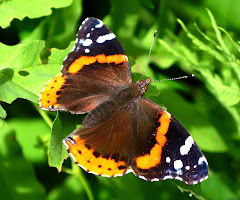 I sent an ID request to BugGuide.net and I'm still awaiting a response. 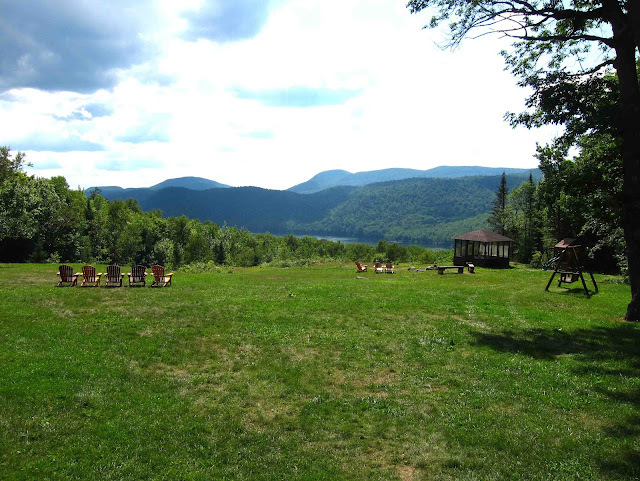 Evelyn next wanted to visit nearby Hooper's Mine, where garnets were once mined from the mountain's bedrock, but first we stopped off for cold drinks in the pub of Garnet Hill Lodge, an all-seasons resort overlooking Thirteenth Lake. The view from the porch of the pub was spectacular! 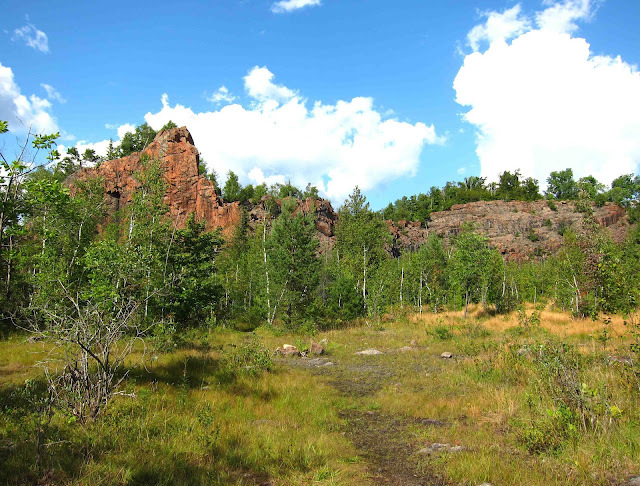 A ten-minute hike up into the mountains brought us to this abandoned quarry with impressive walls of chiseled rock. My photo certainly doesn't do justice to the monumental impact these high walls have when you first come into the clearing. 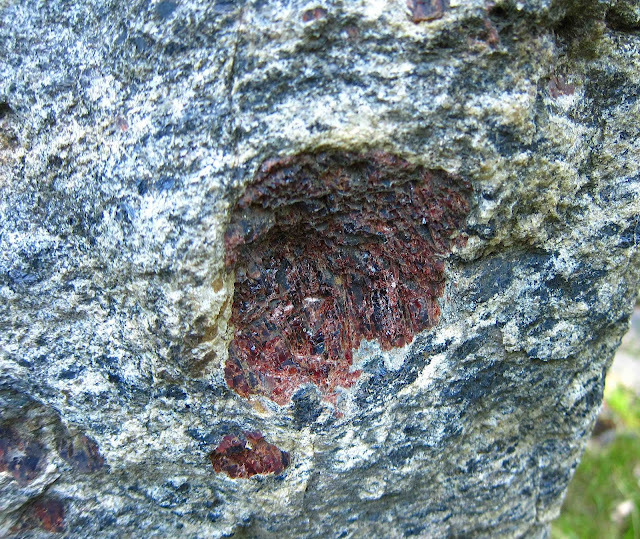 Many garnets remain embedded in the granite here, and it was obvious that people still visit this area with rock hammers and picks to extract the stones. 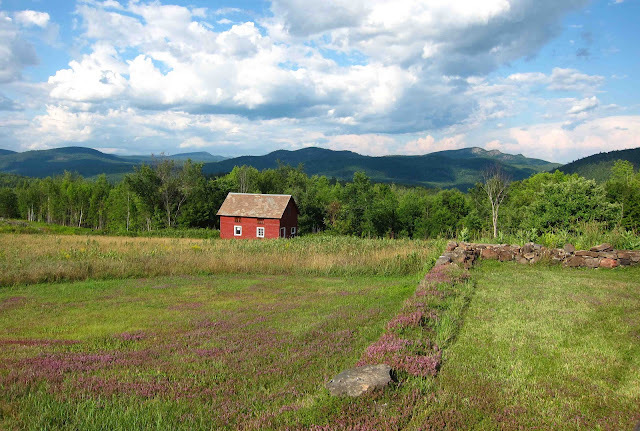 On our way back to North Creek to return Evelyn to her home, she guided us along some back roads that gave us some truly spectacular views of the mountains to the north, the highest peaks of the Adirondacks. Oh, it was quite the day and place for a perfect Sunday drive! I'm guessing, based on your assessment that hooded LT prefer alkaline soils and nodding LT prefer acidic that the ones in our fen (alkaline) are going to be hooded! I MUST get back in there and check! I'd guess they were hooded, too, Ellen, because of their mid-summer bloom time as well as their alkaline habitat. I'd sure like to see the two species side-by-side so I could compare the flowers, but I'm afraid the hoodeds will be faded before the noddings come into bloom. Another nice post Jackie. That scene with the red barn, the rock wall and the mountains looks spectacular (the quarry photo as well). I am always looking for places to photograph like that. Would it be possible for you to share that location with me (I am assuming that is private property and you shot the photo from the road)? I am thinking that would be a nice spot for a fall landscape shot. If you would rather keep the location hidden I would certainly understand. You can feel free to message me privately. As always, thanks for the posts! Stephen, I would be happy to share that location with you, but I probably couldn't for the life of me find it again. We just took random back roads from Thirteenth Lake to North Creek and WHOA!! there it was, this gorgeous scenic vista lit up by the lowering sun. I'll ask my friend Evelyn if maybe she knows the way and respond to you privately if she can remember. Haha thats OK. I will put that area on my list of places to explore as I am sure there are many great scenes to document up that way. Hi! First, I really enjoy reading your blog. 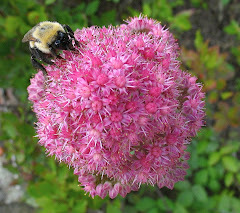 It’s a wonderful example of Botany in New York. I just wanted to comment that I believe the Schoenoplectus in question is S. pungens and not S. americanus. Schoenoplectus pungens has a much longer bract than S. americanus. 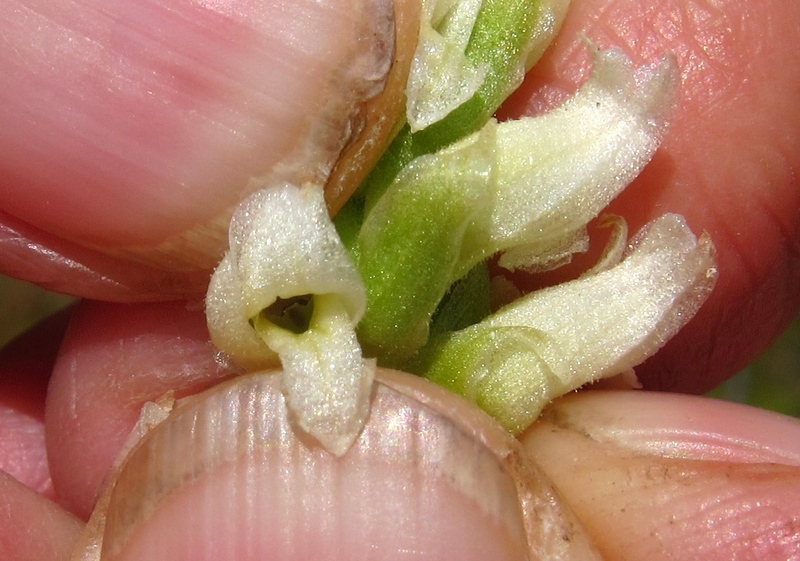 S. americanus also tends to prefer saline areas and the stems are more deeply concave than in S. pungens. The confusion might come from the fact that Schoenoplectus pungens was once called Scirpus americanus. It sure WAS helpful, Diana. Thanks for weighing in with this correction. I will add a correction immediately. And you're right about the source of the confusion, because I was told that this was Scirpus americanus, and when I googled the name I saw the Scirpus had been changed to Schoenoplectus, but I failed to note the change in the species name. When I check distribution maps, too, I can see that Schoenoplectus americanus is not likely to be found inland in the mountains of Warren County, NY. I am really grateful you took the time to set the record straight. Summertime, and the meadows are purple . . .